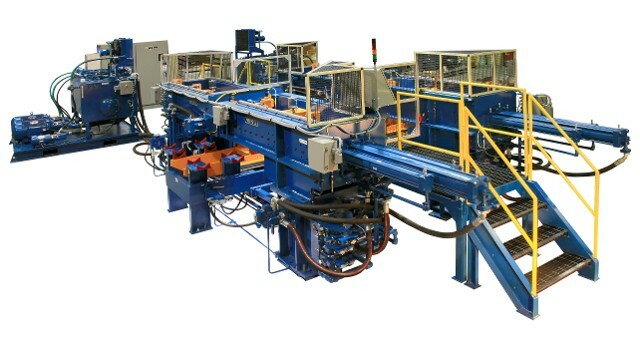 The Axle End forming Machines offer state-of-the-art capabilities to process straight wall and variable wallaxle tubes for the truck and SUV automotive markets. Special die holders and clamping mechanisms offer extreme capabilities in maintaining accurate formed tube straightness. 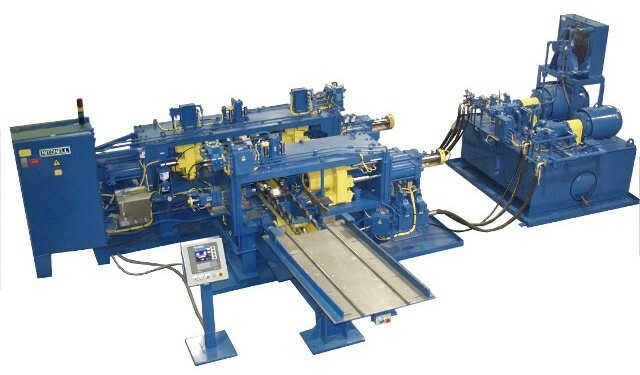 This forming machine forms the counter-bore on the end of the Monotube Shock Absorber Tube body, utilized in many of today's automobiles and SUVs. The unit is capable of processing over one million monotube shock absorber bodies per year. Mitchell's past involvement with shock absorber tubes includes cold forming of inner diameter threads in a McPherson Strut Reservoir Tube design for a major OEM shock absorber manufacturer in North America. The cold forming of the inner diameter threads was accomplished without producing any metal chips. This Multi-Station Tubular Extrusion System was produced for a major supplier of automotive components in the U.S. It's purpose is to cold form cylinder blank tubes for power steering assemblies. The processes are not unique individually; however, the combination of three consecutive extrusion processes is quite uncommon. With no additional lubrication applied between extrusions, over 68% of cross-sectional are reduction is achieved. The cylinder blank tube undergoes four steps of forming during the multi-station extrusion process. In less than one year, over one million tubes had been formed via this process. This machine was produced for an aluminum tube supplier for producing large diameter aluminum drive shaft tubes for the North American automotive industry. 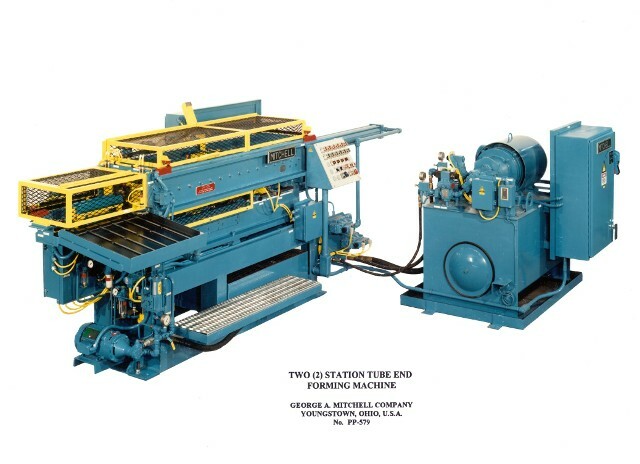 It consists of four (4) forming stations arranged in two opposing sets of tooling. 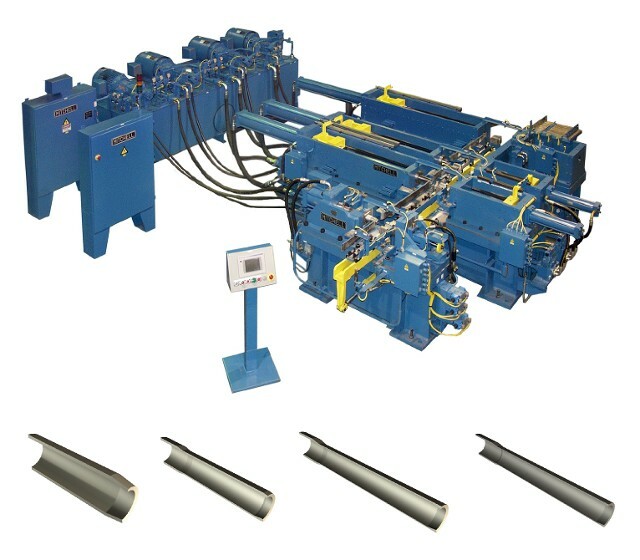 Each opposing set of tools has a center clamp for accurate tube alignment during the forming operation. The machine can be tooled for O.D. reduction only and O.D. reduction with I.D. inverse draw, depending on the product requirements. The machine also includes automatic lubrication for the tube ends and an automatic tube handling system.